1. Line a baking sheet with baking parchment. Pour 100g caster sugar into a large saucepan and warm over a medium heat. Melt the sugar until golden, swirling the pan. Once it becomes even more golden, add the hazelnuts. Working quickly, pour the mixture out onto the prepared sheet. Leave the praline to cool completely. 2. Preheat the oven to 130°C, gas mark ½. Grease and line the base of a deep 20-22cm loose-bottomed cake tin. Melt the butter. Break ²⁄₃ of the hazelnut praline into pieces and place in a food processor with the shortbread. Blitz until finely crushed. Mix with the melted butter. Spoon into the prepared tin and push into an even layer; chill in the fridge for 30 minutes. 3. Hull and chop 200g of the strawberries. Place in a bowl with 25g sugar and the vanilla extract. Crush roughly with a fork. In a clean bowl, beat together the soft cheese with the remaining 275g sugar. Beat in the soured cream, then the eggs, one by one. Finely grate in the zest of both lemons and squeeze in the juice of 1. Stir in the flour, then ripple through ²⁄₃ of the crushed strawberry mixture. 4. Pour over the biscuit base, then ripple the remaining crushed strawberries on top. Bake for 1 hour, or until set with a slight wobble in the middle. 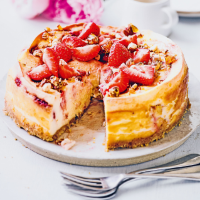 Turn off the oven and leave the cheesecake inside until cooled. Cover, place in the fridge and leave to chill overnight. 5. When ready to serve, crush the remaining praline and halve the remaining strawberries. Use to decorate the top before cutting into slices to serve.